ST. AUGUSTINE BEACH, Fla. – Sea View’s spectacular sunsets are forever. The chance to live in St. Augustine Beach’s newest residential community isn’t. Sea View is located on the narrow, southern portion of St. Augustine Beach, an area known as “the island” where there’s not a lot of land there left to be developed. 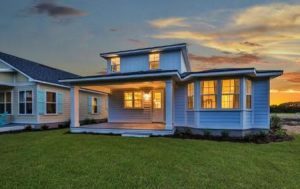 Generation Homes is a custom focused builder specializing in oceanfront and coastal homes. They have created a unique dialogue with homeowners as their personal builder, distinguished for creative designs, quality finishes and attention to detail and customers. Residents can enjoy beach living on large, comfortable front and back porches to capture the ocean breezes. Living in Sea View offers Florida friendly landscape packages for low maintenance and irrigation. Sea View includes a community pool and pocket park. There are no CDD fees. Residents can bike to the beach and take advantage of all that coastal ambiance has to offer while being close to historic St. Augustine, shopping and dining. Starting in the $390’s, homes in Sea View have designer baths and kitchens. The open kitchens have white Shaker cabinets with plywood boxes, dove tail soft close drawers, 42-inch upper kitchen cabinets with crown molding. Kitchen and bath counter tops are available in a variety of color selections and choice of edges. Upgraded GE Profile Stainless Steel appliances include quiet dishwasher, smooth top range with oven, microwave above the range vented outside and garbage disposal. Sea View includes homes thoughtfully designed by acclaimed local architects Rob Florez and Michael Stauffer. Generation Homes builds custom homes in premier communities along the First Coast from South Ponte Vedra Beach to Hammock Beach, including Vilano Beach, Davis Shores, Pelican Reef, Anastasia Dunes, Magnolia Dunes, Marsh Creek, Sea Colony, Sea Grove, and Whispering Oaks and the Hammock on coastal private lots. To learn more, contact Generation Homes (904) 955-4769 or www.generationhomesusa.com.